From the Sobell Department of Motor Neuroscience and Movement Disorders, UCL Institute of Neurology, University College London, UK. Main prefrontal–basal ganglia circuits and relative apathy dimensions (as proposed by Levy and Dubois1). *Lesions associated with poor reward sensitivity. **Lesions associated with poor reward sensitivity and apathy in the study by Rochat et al.5 For simplicity, only the key neural substrates and circuits implied in apathy are shown. Lesions in the insula, found in association with both apathy and poor reward sensitivity,5 are not indicated. 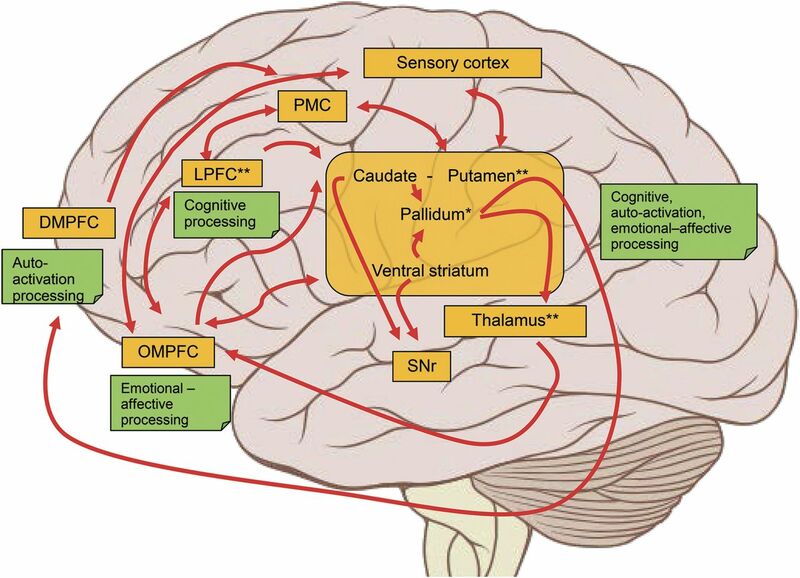 DMPFC = dorsal-medial prefrontal cortex; LPFC = lateral prefrontal cortex; OMPFC = orbital-medial prefrontal cortex; PMC = premotor cortex; SNr = substantia nigra pars reticulata. By Patrick J. Lynch, medical illustrator (CC-BY-2.5 [http://creativecommons.org/licenses/by/2.5]), via Wikimedia Commons. In a recent Neurology® article, Rochat et al.5 addressed this issue directly by assessing the contribution of reward insensitivity to self-reported apathy and how this may relate to damage within frontostriatal lesions in stroke patients. The authors asked 2 simple yet timely questions: is the insensitivity to reward a possible underlying cause of apathy, and, if so, what are the likely affected brain structures related in stroke causing insensitivity to reward and apathy? To this end, the authors performed an observational correlation study with a consecutive screening and enrollment of all eligible patients, the administration of simple cognitive tests, and the use of MRI and CT scans previously acquired for clinical purposes. Although classified as prospective, the work does not present a follow-up time or longitudinal historical data. Patients (55; age <75 years) with a first ischemic or hemorrhagic stroke within 3 months prior to study entry and with a modified Rankin Scale score ≤3 were enrolled. Patients with a history of other neurologic or psychiatric disorders or signs of aphasia or dysarthria were excluded, providing for a relatively homogenous sample. A power analysis suggested that the sample was sufficient to detect a medium-sized effect in a correlation analysis. Fifteen healthy subjects were included as controls. The authors tested a range of cognitive functions, including self-reported apathy (Apathy Inventory), mood (Short Depression and Happiness Scale [SDHS]), verbal working memory (Letter-Number Sequencing task [LNS]), global cognitive function (Mini-Mental State Examination [MMSE], and reward sensitivity (Cued Reinforcement Reaction Time task [CRRT]). A behavioral task has the advantage of permitting an objective evaluation of the implicit reward sensitivity, including both the general trait level of reward responsiveness and the state of reward sensitivity. An implicit associative learning task was chosen to limit the influence of higher cognitive functions. Furthermore, to try to measure sensitivity to reward independently from learning, a reinforcement index (considering only RTs at the end of the task) was computed for each patient. Nevertheless, the fact that performances in the CRRT depend on both reward sensitivity and reinforcement learning is a limitation, as this does not permit clear differentiation of the 2 processes. A broader cognitive assessment could have been useful to rule out generalized cognitive deficits. In particular, evaluation of attentional set shifting and spatial working memory, hypothesized to correlate with performance in the CRRT,6 would have been of interest. The Apathy Inventory provides an assessment of the emotional, behavioral, and cognitive aspects of apathy. This scale has the advantage of being simple and quick to administer. It would have been interesting to separately correlate the 3 dimensions of the scale to reward sensitivity and perform the caregiver-based scale, as patients could lack awareness and underreport their apathy. Negative mood, a characteristic of depression not overlapping with apathy, was assessed through the SDHS, which permits rapid evaluation of the continuum between depression and happiness during the prior 7 days. The article does not report who performed the neurocognitive assessment nor whether the examiners were blind to the purpose of the study and the neuroimaging results. The key result was that reward insensitivity in stroke related to self-reported apathy, even when controlling for lesion size and negative mood. In particular, stroke patients had a diminished reward sensitivity (as measured by the CRRT) vs controls. This effect was not explained by MMSE or LNS scores, indicating that the observed abnormalities were not confounded by general cognitive deficits. The VLSM analysis revealed that higher reward insensitivity was associated with lesions in the bilateral ventral putamen, globus pallidus, dorsal thalamus, left insula, and dorsolateral PFC (DLPFC). Self-reported apathy was associated with bilateral thalamic, right putaminal, insular, and DLPFC lesions, in accordance with the proposed PFC-BG role in apathy1 (figure 2 in Rochat et al.5). The authors then performed a correlation and a hierarchical regression analysis to evaluate the contribution of reward insensitivity to apathy when controlling for variables significantly associated with apathy (i.e., lesion size and negative mood). This analysis permits control for potentially interacting variables and is a strong point of the study. This study evaluates the role of reward insensitivity in apathy after stroke. The results support the hypothesis that low sensitivity to reward contributes to poststroke apathy and that the PFC-BG circuits as well as the insula may be part of the underlying network. This represents an important step toward the understanding of apathy pathophysiology. Considering the increasing attention on behavioral and home-based rehabilitation, understanding the motivational processes in stroke is central. In particular, measures of reward sensitivity and apathy such as the CRRT can improve therapies by providing a measure of the potential effectiveness of rewards and thus permitting individualized interventions based on the behavioral profile of patients. We note a few limitations that hamper our enthusiasm and provide motivation for future work. First, a deficit of learning could have influenced performance on the CRRT. As the BG are involved in both reinforcement learning and motivation,9 lesions may have influenced these processes separately or together. A task permitting dissociation of learning from reward sensitivity, or the examination of the learning curves of the cues/RTs contingency, would have been useful. Second, the sample size is relatively small and not representative of the whole stroke population. This could be relevant considering the aforementioned need for a large number of observations when using VLSM. A similar observation can be made for the control group, for which no inclusion and exclusion criteria were clearly reported. We also note that reporting the medication status would have allowed for accounting for any mood or hedonic medication effects. Moreover, the stroke side was not specified. This could be important as, even if only well-recovered subjects were included to limit the influence of motor or sensory deficits, any residual impairment is likely to affect RTs. Inclusion of upper limb impairment rating scales could have controlled for such effects. In addition, the interval between stroke onset and neuropsychological assessment was variable (3–148 months), and its inclusion in the analysis similarly could have controlled for its influence. Finally, the use of a more extensive neuropsychological assessment could have been of interest. Considering imaging, as the authors mentioned, the use of different modalities (MRI and CT scans) could have reduced the overall quality of data, as scanning protocols and image quality were variable. Finally, the time interval between stroke onset and scans was not reported and variability in this time could have influenced the results. Further studies using behavioral as well as pharmacologic tools are warranted to clarify the role of reward insensitivity in apathy. In the future, relating the pattern of brain lesions to the specific disrupted processes leading to apathy might permit individualized pharmacologic and behavioral management in stroke and in other neurologic disorders. Graziella Quattrocchi: drafting/revising the manuscript, study concept or design, analysis or interpretation of data, accepts responsibility for conduct of research and final approval. Sven Bestmann: drafting/revising the manuscript, analysis or interpretation of data, accepts responsibility for conduct of research and final approval, study supervision.
. Apathy and the functional anatomy of the prefrontal cortex–basal ganglia circuits. Cereb Cortex 2006;16:916–928.
. Apathy and the basal ganglia. J Neurol 2006;253(suppl 7):54–61.
. Poor reward sensitivity and apathy after stroke: implication of basal ganglia. Neurology 2013;81:1674–1680.
. Inappropriate usage of the Brunner-Munzel test in recent voxel-based lesion-symptom mapping studies. Neuropsychologia 2010;48:341–343.
. Contributions of the striatum to learning, motivation and performance: an associative account. Trends Cogn Sci 2012;16:467–475.